Okay, credit where it’s due, it’s actually ‘keyboards and tambourine’ (oh, and a bit of guitar). After years of gentle debate about the merits of having a keyboard player in the band, we found a player that really works for us. Coming from a classical background and, crucially, being able to apply that knowledge to a pop/rock/theatre band makes Col a valuable member of any musical project he works on. He’s a proper player so doesn’t have to rely on any trickery available to synthesizer players. He does a lot more than just fill up the sound with a wall of strings, which is what many, less able players, tend to do. Col’s broad musical knowledge fits easily within the band and his presence in the Spiderz hugely increases the variety of material the band can play. Col trained as a classical pianist before being struck by ELP. Suddenly keyboards became rock’n’roll. Later, Col got into the keyboard bands of the time: Kraftwerk, Gary Numan, John Foxx et. al. 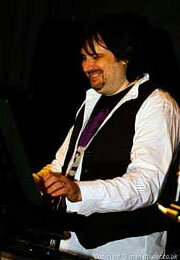 Col also writes and performs music for theatre productions. Col went to school with Tim and Faz and, having decided to add a keyboard player, was an obvious choice for the band.